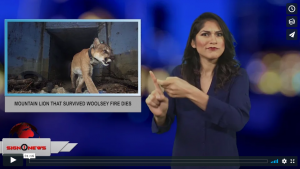 The male mountain lion survived the Woolsey fire in California only to die a few weeks later. The Culvert Cat made a name for himself by using the Liberty Canyon storm drains multiple times to survive. The park service tracked him by a GPS collar for nine months. A park service biologist hiked into his last GPS location on December 3 and found his remains nearby. He appeared to have been dead for a few days. His paws were visibly burned. He was three or four years old and is the suspected father of four female kittens born in May of this year. The California Department of Fish and Wildlife will conduct a necropsy to determine the cause of death.